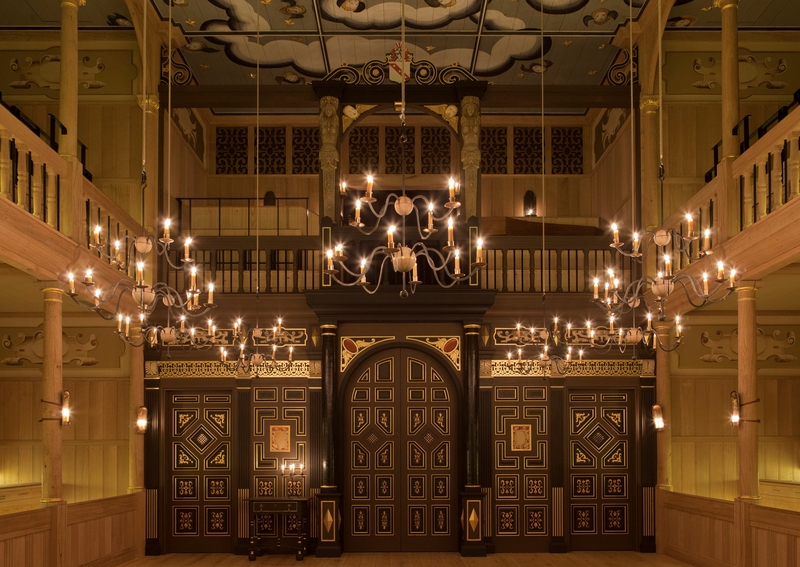 Felicity Martin, SPAB’s membership and development officer, introduces the theatrical ‘reimagining’ that is the Sam Wanamaker Playhouse in London. From the summer 2015 SPAB Magazine. The Sam Wanamaker Playhouse is probably my favourite new ‘old building’. It is certainly the most uncomfortable modern theatre that I’ve visited. Shakespeare’s Globe claim that it is not a reconstruction of a Jacobean playhouse but a ‘reimagining’ – what else would you expect from a theatre company? It is a beautiful chamber, lit with almost a hundred candles in ‘branches’ (metal candelabras) and ‘wallers’ (sconces). The audience sits on three sides of a thrust stage within an oak timber frame, with a musicians’ gallery above. In the heavens, the goddess Luna is haloed with gold leaf, surrounded by pale chains of clouds, stars and cherubs. The design was inspired by a ceiling in Cullen House, Banffshire, now lost. I can reassure those wary of pastiche that there is no pretense that this is not an illusionary space – the fabric is unmistakably new and crisp, still smelling of cut wood and melting beeswax. It suits modern tastes in being quite restrained in its decoration and it was built using traditional methods with hand-carved details. Though the columns were turned with an electric lathe, its speed was slowed down making tooling marks similar to surviving Jacobean examples. Sam Wanamaker Playhouse. The ceiling depicts the goddess Luna surrounded by chains of clouds and cherubs. Photo by Pete Le May, supplied by Shakespeare’s Globe. At university the story I heard was that in 1960s some documents fell out of a book in the library at Worcester College, Oxford, found to be the earliest existing drawings of an indoor English theatre. At the time these were thought to be by Inigo Jones (Sam Wanamaker built the external brick shell based on this in the 1990s) but current thinking attributes them to one of Jones’ assistants, John Webb, from rather later in about 1660. The drawings do not illustrate technical plans but were probably a rough design of an indoor theatre, based on those of a generation earlier, well before the footlights of the Restoration. Jon Greenfield and Allies and Morrison drew their inspiration from these and surviving buildings of the period to complete the theatre, which opened in January 2014. The hope at the Globe is that this ‘reimagining’ is one that Shakespeare and his contemporaries might recognize. 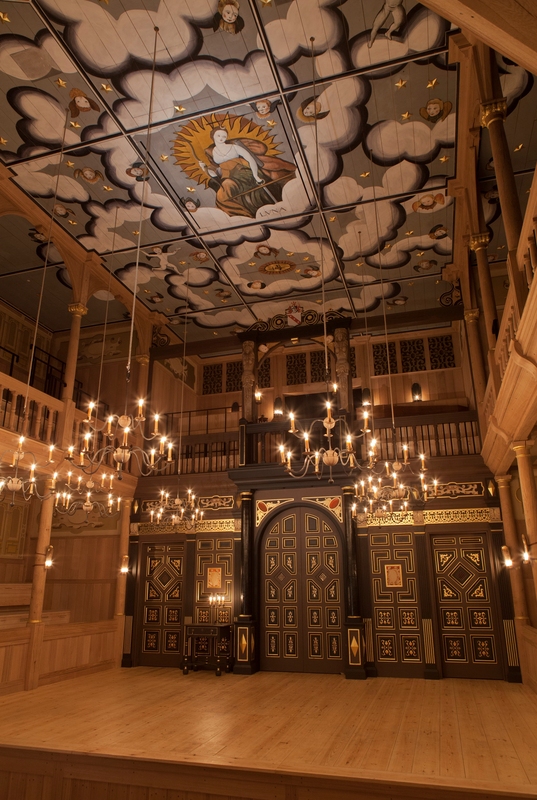 As with the Globe, this theatre was designed and built to experiment with ‘authentic’ performance, not only of Shakespeare but also for staging the darker English genius present in the Jacobean revenge tragedies or the raucous satire of the City comedies. We know that moving indoors changed the structure of plays, introducing intervals to trim the candlewicks. For the dramatists it also posed possibilities of lighting and sound effects which must have influenced their writing: would the fury of The Tempest be heard outside or the dark shadows of The Duchess of Malfi be seen in daylight? Photo by Pete Le May, supplied by Shakespeare’s Globe. I must admit that a great part of the magic of this theatre for me is the candlelight. In our electric world the warm glow is festive and evokes the rituals of religious practices. The flames are reflected in the sumptuous details: the ruffs, the pearlescent makeup, the creases in pale silk and the starry ceiling. The intimacy of the space is deceptive; bodies are tightly packed, the actors brush past, candles sometimes drip and the darkness – when it is used – is startlingly complete. The acoustics are crisp and allows the more delicate period instruments to sing out. The physical experience is at complete odds with our modern audience expectations – you are likely to enjoy a restricted view of the stage, limited space, relatively dim light and unchanging scenery. The actors are unencumbered with microphones or a curtain to hide behind and yet they are their own lighting technicians. All focus is on the words and music, on gesture and tone. While the performances might be more historically informed, the building suits our modern taste for the immersive, multi-sensory entertainment experience. Though the building is new, it helps us to imagine another time.